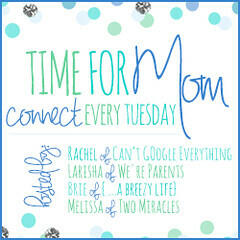 I finally had what I envision as “the perfect working mommy night” and wanted to document it because it may never happen again. The irony, of course, is that I had today off work, but Guinevere still went to daycare, so it counts as a “working mommy” night to me even though I didn’t go to work. I picked G up from daycare at the normal time. She was super smiley and adorable when I got there, which made me really happy because the last couple time I’ve picked her up, she’s been a cranky-pants. I’m guessing she had a lot of fun at daycare today. Aaron and I were both super sick over the weekend (either food poisoning or stomach bug, not sure which), so I’m sure we were pretty boring to be around for the past two days, and daycare was much more fun in comparison. I didn’t really start feeling back to myself until about noon today, so I’m actually really glad that I had today off work and G had daycare! 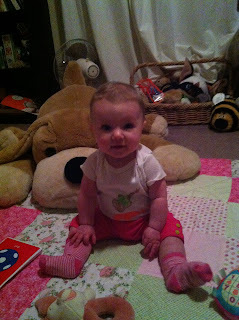 When we got home, Guinevere and I played in her room. I sat her down on the floor with her big stuffed dog, Eric, behind her (just in case she fell backwards) and just let her play and explore. She’s sitting so well now! I was even able to leave the room to briefly get dinner started and when I got back, she was still happily playing with her toys. I think she’s getting close to army-style crawling. I put her on her tummy and put her toys in front of her and she started swaying and attempting to move her legs. She just hasn’t quite got the coordination down yet. Then she gets frustrated and starts doing the “Superman” (both arms and legs up in the air). After playtime, we ate dinner together. I gave up on the whole puree thing for tonight. She seems to like feeding herself much better than me spoon-feeding her. So I gave her some puffs to eat while I finished making dinner. Then I gave her some food off my plate: broccoli, zucchini, cauliflower, chicken, and a piece of biscuit. 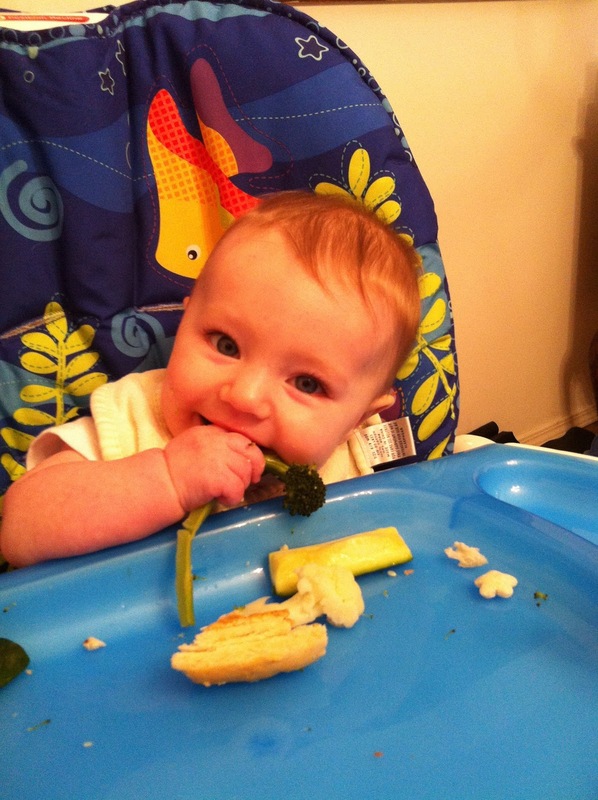 She seemed to love it all – though, she loved the broccoli and zucchini the most. Then I gave G bath. She laughed and giggled the whole time. It’s the first time since she was a newborn that she seems to really have enjoyed the bath. I was singing to her, and she started “singing” back. Of course, it helped that I was really just humming “da da da, lalala” – so it wasn’t hard for her to repeat it. After bath time, I gave her her final feeding of the night. She drifted off into that beautiful “milk drunk” dream state . . . for about five minutes. Then I put her in her sleepsack and read to her. I attempted to read a book about puppies in Spanish, and then followed it up with “Goodnight Moon.” Then I sang her a couple songs and put her to bed.